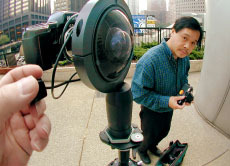 Jook Leung is internationally recognized as an innovator in spherical panoramic photography. He specializes in creating unique and exceptional 360 degree panoramas. A mini portfolio of his artistry with spherical panoramas can be seen on the Adobe Photographers Web site. Among his peers, he was recently recognized with his Third consecutive Fujifilm Masterpiece Award (October 2005) and with the Best of Show Award in Panoramic Image Excellence from the International Association of Panoramic Photographers. Jook has added 2006 to his ongoing "Times Square New Year's Eve at Midnight." A 360VR project that relives the moment and can be seen at 360vr.com/TimesSquare. 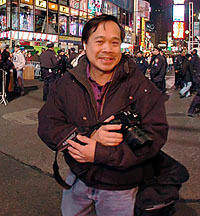 His "New Year celebration in Times Square 2005" panorama was chosen for Best of Show distinction from among his peers from over 200 international entries at the International Association of Panoramic Photographers' Convention and Print Exhibition held in Springfield, Massachusetts - (October 2005). For photographic excellence in the year 2002, Jook received his first Fujifilm Masterpiece Award from the IAPP for his 360 degree panorama: "Tribute In Light" in the Electronic Imaging category. "This award represents a strong commitment by Fujifilm to recognize photographic excellence", explains D. John McCarthy, Professional Markets Specialist and Field Marketing Manager for Fuji Photo Film U.S.A., Inc. "The Masterpiece Award is the highest honor that any photographic manufacturer awards for photography without regard to the type of products used to create the image. We are proud to honor such distinguished photographers as Jook Leung". In his personal self-assignment work, Jook has been practicing "Guerrilla VR" for several years now. He uses his body as a mono-pod and trains his eye to rotate the lens around one point in space. This allows Jook to shoot freely without the encumbrances of a tripod. This essential technique allows Jook to pursue defining moments in a scene much as a photo-journalist would, and also capture it as a whole environment image. Assembling the panoramas is another learned skill that is a mixture of software tools and photo-illustration techniques gained from being an accomplished professional photographer. Jook has a talent for capturing exceptional photo-journalistic style 360 VR panoramas. Being aware of 360 degrees is something like training another pair of critical eyes to see and sense unfolding moments in all directions. Visit and revisit the Freedom Towers Ground Breaking Ceremonies at Ground Zero in NYC on July 4, 2004 and explore it interactively through 360VR Images. This is one of Jook's first 360 degree panoramas taken in Times Square in 1997 and was used in a Mercedes-Benz Tri-fold Ad. Jook's stylistic 360 VR images are visually vivid and uniquely conceptual. His strong sense of composition, color and lighting is the hallmark of his best 360 VR panoramas. Jook's experience spans 25 years as a commercial photographer with a background in photo-illustration and digital imaging. His advertising and editorial photography can be seen at: JookLeung.com. This combination of talents gives him the ability to produce exceptional Virtual Reality panoramas and tours for his clients. For the past 9 years Jook has specialized in making Photographic Virtual Reality 360 degree panoramas his playground for creative and visually innovative images. Jook is an active member in these professional associations: IAPP - International Association of Panoramic Photographers and IVRPA - International Virtual Reality Photography Association. He is a Qualified Panoramic Photographer (QPP) as certified by IAPP and has given presentations and workshops about his work at IVRPA/VR Summits and IAPP Conventions. He has also written articles for Panorama Magazine. In January 2005 his panoramas were featured in an interview on abc's News Now.